It’s been an ugly week for the Redskins, both around the team facility as well as all throughout the media and online. 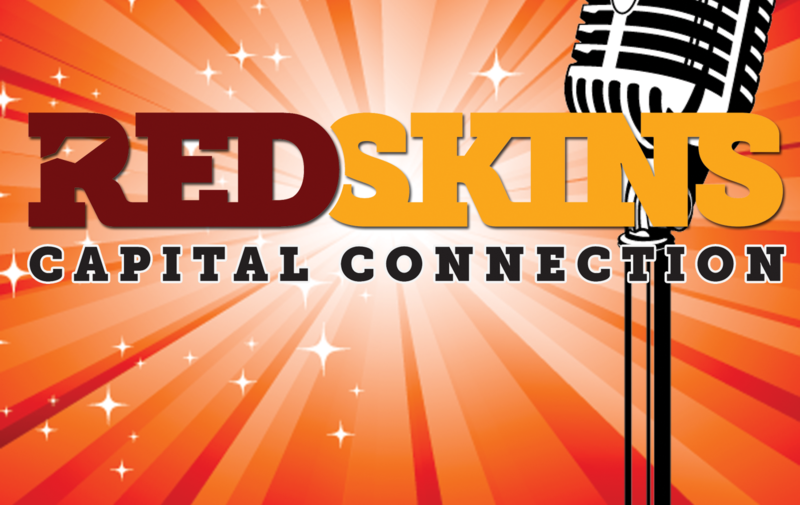 In an effort to alleviate some of the misery, and as an excuse to write about a variety of different topics in one single post, we’ve decided to do our first mailbag article here at Redskins Capital Connection where we invited your questions on Twitter. @ChadwikoRCC Do you think Breeland eventually takes over a starting spot this year? It all depends on how you define “starting spot”. If you include being the number one nickel Cornerback on the roster, then Bashaud Breeland already is starting. However, if you are referring to one of the starting outside Cornerback positions currently being held by Chris Culliver and DeAngelo Hall, that’s where things get more complicated. Throughout Training Camp, Culliver and Hall were the first-team outside corners and Breeland was the starting nickel. At least, that was the intention. When both Hall and Breeland got injured relatively early in the Training Camp schedule, it necessitated trying different personnel in different ways, including having Wide Receiver Quinton Dunbar swap from the white offense jersey to the burgundy defense jersey and taking reps as a defensive back. When everyone is healthy (and not suspended), then I don’t see Breeland takes over one of the starting outside Cornerback positions this year. He plays well from the slot and it gives him an opportunity to continue his development as a professional defensive back without leaving him exposed against some imposing opponents that the Redskins will see at Wide Receiver this year, such as Dez Bryant, Alshon Jeffery, Odell Beckham Jr, and Julio Jones. Furthermore, for the very short amount of time that we have gotten to see the trio of Culliver, Hall and Breeland working together at their respective positions, it has looked like a cohesive and capable unit. Injuries always change plans, though. If one of Hall or Culliver goes down, Breeland is likely to step up into that role and then Justin Rogers will see more snaps from that nickel position. In both previous articles as well as numerous podcasts I’ve spoken at length about the addition of Coach Bill Callahan, who has taken over the responsibility for the Offensive Line. Therefore instead of repeating myself on Callahan, I’ll talk about another Coach who has impressed me so far, especially throughout Training Camp; Assistant Strength and Conditioning Coach Joe Kim. 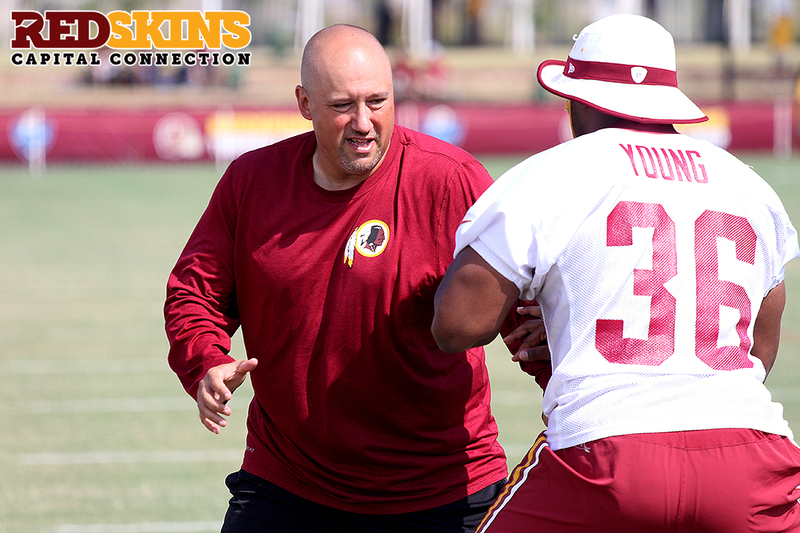 Coach Kim joined the Redskins this offseason from Chicago, and he’s worked with a variety of teams in an NFL career spanning over 20 years. What stands out with the way Coach Kim operates is the different styles of techniques that he uses to work with his players. Kim is a Grandmaster 7th-Dan blackbelt in Taekwondo, recognized internationally for his prowess, and watching him work with players on their technique when it comes to getting their hands through and under their opponents is unlike anything previously seen on an NFL field. Kim works with both sides of the ball, as well. He teaches blockers on the Offensive Line as well as the Running Backs how to use their hands to ensure that defenders can’t easily get leverage against them. When he works with defenders, he teaches them how to get around that anyway. It’s fascinating to watch, and is a really intriguing method of developing effective techniques to be utilized on the football field. @ChadwikoRCC is there a dark horse pass rush specialist on the roster right now? Considering the relative short amount of time that Junior Galette was on the roster, it’s interesting just how much of a setback his injury proved to be. With Galette lining up opposite Ryan Kerrigan, the Redskins pass rush looked absolutely fearsome, and was worthy of discussion as amongst the best in the NFL. With Galette done for the year, the pass rush opposite Kerrigan is likely to be based around a rotation of Trent Murphy and Preston Smith. Neither players are elite at their positions (yet), but both are certainly capable of being effective and productive Outside Linebackers. In his rookie season last year, Murphy demonstrated that he was best used against the run, with Pro Football Focus ranking him 6th overall at the position in this metric. With the strong additions made to the interior of the defensive line, such as Stephen Paea and Terrance Knighton, the Redskins pass rush overall should be improved in 2015. With Offensive Linemen no longer being able to dedicate double teams to Kerrigan lest they leave themselves exposed to the raw power of Paea and Knighton, it gives both Murphy and Smith a great situation to come in on the Right side of the front seven and be able to do their job without an enormous amount of pressure on them to perform immediately. 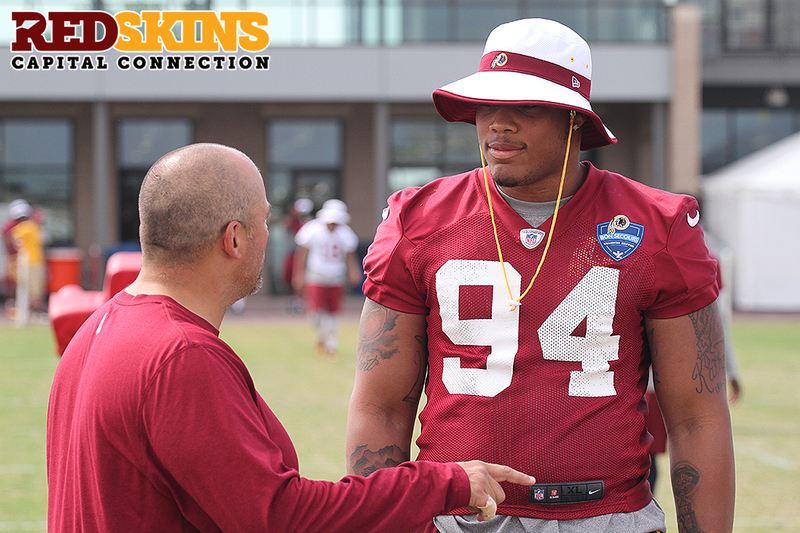 This is especially important for Preston Smith. He’s flashed on some fantastic plays in his time with the Redskins so far, both in Training Camp and in the first two preseason games. However, he is still quite raw, and has demonstrated that he is relying on his physical acumen as opposed to developed technique. Once he can build up his repertoire of skill moves and combine them with his speed off the line, he has the potential to be a dynamic pass rusher. @ChadwikoRCC What does Evan Spencer need to improve the most on? Do you think he could become a reliable or dynamic WR? How r his RZ chops? Consistency and reliability is the key for Evan Spencer. As the only Wide Receiver on the roster with good height for the position (Spencer is listed at 6’2), he has an opportunity to carve out for himself a specific role on the Redskins offense, especially in the redzone like you mentioned. The issue for Spencer so far has been getting his hands on to the ball and then holding on to it tightly. During camp Spencer got the bulk of his work with the second unit offense, and for every great catch he made over the top of a defender, there were just as many plays where he was completely unable to work himself open, or more frustratingly he got open but then dropped the ball. He’s a 6th round rookie and this is exactly what Training Camp is for, so it’s not too alarming yet. But Spencer is likely the type of player who needs at least 1 year in the NFL system before he starts to deliver on his potential. It’s true that the Redskins are seeming especially cursed with injuries so far in 2015, with five players who were likely to be on the final 53 man roster having gone down. History tells us that whenever injuries are attributable to strength and conditioning programs, they tend to be soft tissue injuries such as hamstring and groin injuries. The type of injuries suffered by Niles Paul, Adam Hayward, Junior Galette and Logan Paulson don’t fit this description. Football is a contact sport played in bursts, and injuries are just a sad reality that comes along with playing the game. When one team seems to get hit harder than others, it’s only natural for questions to be asked seeking to understand if there have been any specific reasons behind it. Unfortunately for the Redskins so far, it’s just been a case of plain old bad luck. @ChadwikoRCC In ur opinion if Robert fails to perform well in the first couple of reg season games how long will Jay wait to replace him? That’s the million dollar question, and it is really the dark cloud looming over Ashburn right now. 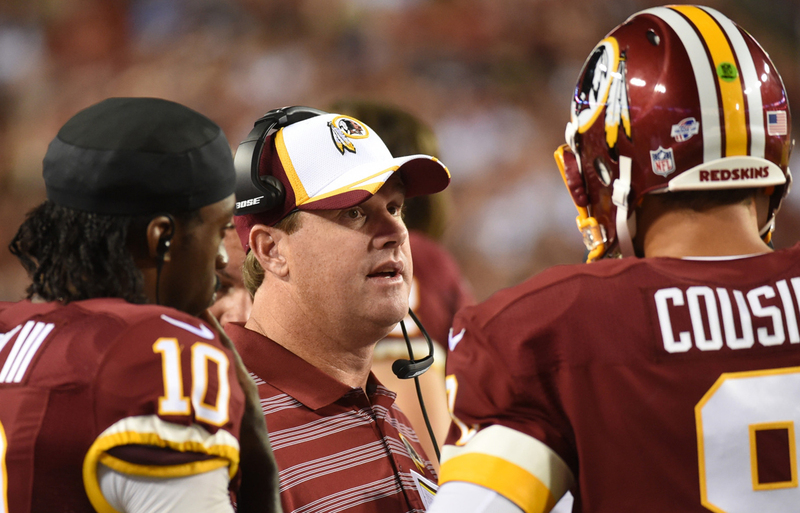 Robert Griffin III is causing a lot of consternation at the moment for the Coaches. All throughout Training Camp he looked by far the best Quarterback on the roster, and it really wasn’t even close. Throughout 7 on 7 or 11 on 11 drills, Griffin was releasing the ball accurately, quickly, and with noticeably improved techniques when it came to his footwork and dropbacks. He was going through his progressions precisely, and most sessions it was unusual for Griffin to have an incompletion unless it was just a case of the receiver dropping a well-thrown ball. In the first preseason game against Cleveland, Griffin didn’t look spectacular but it’s important to remember that he also didn’t look bad. If Pierre Garcon hadn’t dropped that near-perfectly thrown deep strike that was a guaranteed touchdown, the conversation following the game regarding Griffin’s performance would have been remarkably different. Of course the second preseason game against the Lions was a different story. Whilst it is completely valid to place a large portion of the blame for the first team offense’s inability to move the chains on the Offensive Line, Griffin is certainly not without equal share of that responsibility. After seeing such improvement on fundamental techniques in Richmond, Griffin seemed to relapse into bad habits under pressure. It’s something that I’m sure Quarterbacks Coach Matt Cavanaugh will have been perplexed by, and if the tape machines in the Quarterbacks room at Redskins Park this week haven’t been filled with teaching examples of where Griffin needs to improve it would be a shock. Once the regular season starts, unless Robert Griffin III looks spectacularly bad (and we’re talking worse than he’s ever been), then he’ll likely be given the first six weeks at the very least to try and work himself into good form. The schedule in the first six weeks sees the Redskins play Miami, St Louis, New York Giants, Philadelphia, Atlanta, and the New York Jets. That is a great mix of opponents in terms of trying to evaluate Griffin’s play. If following those six games no progress has been made and Griffin is still struggling, then a switch could be made for the Week 7 game versus Tampa Bay here at FedEx Field, giving the team one week of a new Quarterback before heading into the Week 8 bye and regrouping.